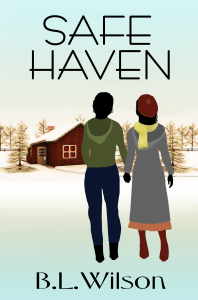 In her novel Safe Haven, a runaway ‘wife’ discovers love in the arms of a female doctor who treats her broken bones and bruises then mends her broken heart. Joanna Fairfield AKA Ms. Smith AKA June Davis is on the run from a murderous man who wants more than her love. Vicious killer Vernon Brown wants to take Joanna’s son, adopt him and kill her. Running away for the second time on a dark stormy night, Joanna stops in a place called Eagle View, North Carolina. It’s the small town her grandmother always claimed was a good place to raise any child. Her son, Danny is ill and she needs a doctor. When she meets the town’s one and only family doctor, Dr. Ellie Winston, sparks fly.